Pure DIETHYLENE GLYCOL MONOMETHYL ETHER, "carbitol". 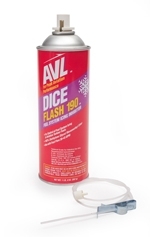 DICE Flash 190 is the identical chemical formulation utilized by the United States Air Force turbine fleet. This chemical replaces ethylene glycol monomethyl ether as a less toxic and non-hazardous fuel system icing inhibitor. Comparable to Prist. AIR DELIVERY WILL BE ASSESSED HAZMAT FEE OF $37.50 PRIOR TO SHIPMENT.